Dog kennels provide your dog with safety and security. We feature a variety of dog kennels to help you train and protect your pet. Walgreens.com offers all kinds of pet supplies from well-known brands like Petmate and Midwest. 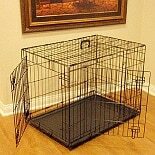 Our wide selection of dog crates offers something for everyone. We sell a variety of single- and double-door kennels that make it easy to get your dog in and out of the crate. Some of our featured kennels also come with dividers, so that you can make the interior of kennel larger or smaller as needed. 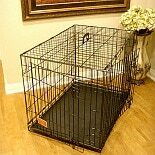 Kennels with dividers are ideal for dog owners with puppies that will grow into large dogs and for dog owners with multiple pets. For your convenience, we also offer folding dog kennels that are easy to store, transport and set up. In addition, we sell exercise kennel pens that will give your dog plenty of space to move around in whether they are inside or outdoors. Portable dog kennels offer your dog comfort and safety while you travel. These kennel cabs can be secured in cars with a seat belt. These small dog kennels are also designed to meet airline regulations, so you can easily travel with your dog by air. Our portable dog crates have sturdy handles that make them easy to carry. Some of our kennels even feature eyelets for shoulder straps. Along with metal kennels, we also sell a soft-sided kennel that features an adjustable shoulder strap and mesh ventilation.